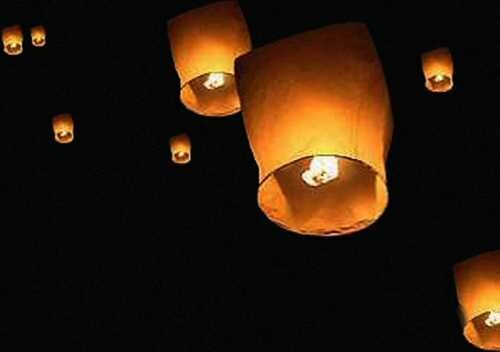 Traditional Chinese-style Flying Lanterns. Send your lantern soaring to celebrate the New Year, Weddings, Birthdays, Halloween, Bonfire Night or any other special event. It will fly for up to 20 minutes and can rise over a mile in the sky – where it will still be visible all around! Traditionally used in Chinese and Thai celebrations, these are a beautiful and fascinating way to light up the sky that’s becoming increasingly popular throughout the world for any kind of event. Flying Lanterns are traditionally known as ‘Khom Fay’ or ‘Khom Loy’ in China and have been used for nearly two thousand years. It was believed that wishes written on lanterns would rise up to the heavens and come true. The Sky Glow Flying Lantern is made from flame-retardant, bio-degradable materials and the frame is made from Bamboo – a wood that is quickly replenished. A quieter, gentler alternative to fireworks, flying lanterns are the safe, simple and perfect way to create an amazing visual display in the sky!